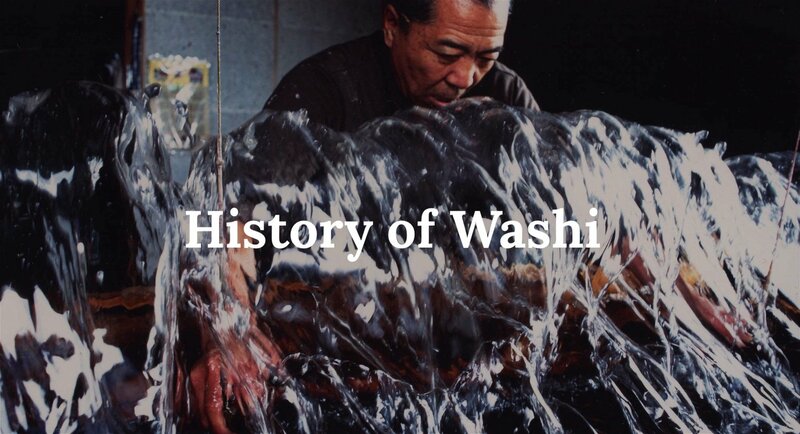 History of Washi – Hiromi Paper, Inc.
Papermaking was introduced to Japan more than 1,300 years ago. The Chronicles of Japan, Nihon Shoki, written in the year 720, state that the Chinese methods of making ink and paper were introduced to Japan by the Korean Buddhist priest, Doncho, in 610. The Prince Regent Shotoku found Chinese paper too fragile and encouraged the use of kozo (mulberry) and hemp fibers, which were already cultivated for use in making textiles. The techniques of making paper spread throughout the country and under his patronage, the original process slowly evolved into the Nagashizuki method of making paper, using kozoand neri (a viscous formation aid that suspends fibers evenly in water). These skills have been passed down from generation to generation, producing a paper that was not only functional, but reflecting the soul and spirit of the maker. The close relationships between the papermaker and his paper and then paper to paper user resulted in washi becoming an integral part of Japanese culture. Traditionally, the making of washi was a seasonal process. Most of the papermakers were farmers who planted kozo and hemp in addition to their regular crops. The best washi was made during the cold winter months. This coincided with the season when the farmers could not work in their fields and the ice water was free of impurities, which if present could discolor the fibers. During the Meiji period (mid-19th Century) the demand for paper greatly increased. However, the Meiji period was the beginning of the shift from washi to western paper and from handmade to machine-made papers. Despite the change in demand, the strong yet flexible washi is still a large facet of Japanese culture; it is still used for special religious purposes (both Buddhist and Shinto), in the production of daily items like toys, fans, and garments, as well as for conservation purposes and washi’s most universally recognized function, traditional architecture. As new uses for paper are being discovered and tested, so too must washi evolve while the papermakers uphold their traditional skills. Thanks to the gravitation of artists, conservators, enthusiasts, and craftspeople to the strength, flexibility, and beauty of washi, Japanese papers are becoming relevant once more. Washi is now on display in exhibitions, installations, discussions, and architecture throughout the world making it increasingly accessible and inspirational for those who have not yet witnessed its remarkable potential. Kozo (Mulberry) bark is used in approximately 90% of the washi made today. Kozo was originally found in the mountain wilderness of Shikoku and Kyushu Islands. It became a cultivated plant used especially for paper and cloth making. 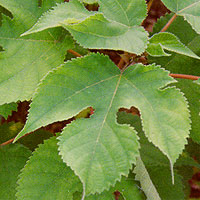 It is a deciduous shrub that grows to a height of 3 - 5 meters with the stem measuring up to 10cm across. 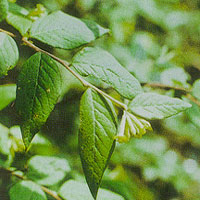 A bush found in the mountainous, warm areas of Japan. Gampi grows to 1.0 - 1.5 meters in height. It has been used as a washi-making material for many years due to the high quality of the fiber taken from the bark. The finished paper is somewhat translucent and has a shiny texture. Gampi cannot be cultivated and is therefore rare and the most expensive of these three materials. 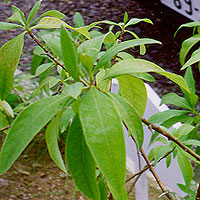 A bush that originated in China, Mitsumata grows to 1.0 - 1.5 meters in height. Records indicate that it was used in papermaking as early as 614. The fibers are shorter than Kozo's. Mitsumata papers have insect-repelling qualities. Kozo is the primary material for Washi and grows 10 feet between its annual harvests. In winter, the Kozo shrubs are harvested by cutting the stalks to equal lengths and bundled. The bark is made up of three layers, the black outer layer (kurokawa), the middle green layer (nazekawa), and the whiter inner layer (shirokawa). There are some papers that use pieces of the outer black bark and middle green layers, however most do not. The Kozo bundles are placed in wooden barrels and steamed. After being steamed, water is then poured over the stalks enabling the bark to slip off easily, at which time the fragrance of Kozo is very rich. Cooking is done in a large tub until the white bark is very soft. It is very important in this step to cook the bark evenly so that the fibers have a consistent makeup. The fibers are cooked for about two hours in an alkali solution. Traditionally the alkali used was extracted from wood ash (pot ash), but now slaked lime, soda ash, caustic soda, or lye are generally used instead. The alkali solution is heated until it boils and then is lowered to a simmer. As the fibers soften, the bulk of the fibers decrease. The quality and feel of the washi is determined by the amount of non-cellulose materials contained in the fibers. When a strong alkali is used, most of the non-cellulose materials are dissolved and this results in a soft paper. On the other hand, when a weak alkali is used more of these materials remain, resulting in paper which has more body. The type of alkali used can also affect the color and feel of the paper. The rinsing and cleansing process after the fibers are cooked is called "Chiritori" A small amount of the cooked fiber is put into a bamboo basket floating in water and then any scar tissue, buds, unevenly cooked parts or discolored areas are removed by hand. If white paper is to be made, the fibers are bleached before the chiritori process. Usually sodium hypochlorite is used but natural bleaching methods using water or snow are still sometimes used. Two essential pieces of papermaking equipment are the vat (suki-bune) and mould ( suketa). The vat is usually made from pine or cedar but a stainless steel liner may be added for durability. The Japanese style papermaking mold consists of two parts. The specially made flexible removable screen (su) is made of fine bamboo strips held in place by silk threads. Kozo pulp and Neri are mixed in water very well. Then using a Su (bamboo screen) and Keta(wood frame) the mixture is moved aback and forth, and side across the mold to form the sheet. The fiber settles and the step is repeated again and again depending until the desired thickness is achieved. This method is very different from the Tamezuki or accumulation method of making paper. The Tamezuki method is the Japanese term for the western style papermaking. The first scoop is shallow dip that is quickly flowed across the surface of the screen to form the face or front of the sheet of paper. The excess pulp is allowed to flow over the far edge of the mold. The rapid movement prevents any hard particles from setting on the screen surface. The next step consists of a deeper scoop into the vat and the pulp flows over the screen several times before any excess is allowed to flow over the far edge. This step is repeated several times until the desired thickness is achieved. The movement of the pulp mixture on the screen surface varies according to the kind of paper being made. There is an overhead bamboo suspension system that helps to counterbalance the weight of the pulp mixture on the screen surface. This makes it easier to move the mixture over the surface. The screen with the completed sheet of paper is then removed from the mold and couched (paper removed from the screen) onto a special stand that holds the post of newly made papers. The screen is aligned using the placement guides and carefully lowered onto the previously made sheet in such a manner as not to trap any air between the papers. The screen is then removed by lifting the edge nearest the papermaker, and then it is lifted off away from the papermaker. The post of completed papers is left overnight to drain naturally. Then it is carefully pressed, lightly in the beginning then gradually more pressure is applied in order not to damage the paper. The post is pressed for about 6 hours until approximately 30% of the moisture is removed. Dried sheets of Kozo paper are held up to the light, then classified by thickness, color, etc. Through all this natural process the Washi has acquired a warm, delicate look and strength.